This protractor , graduated along its circumference, has a diametrical bar, which is also graduated. 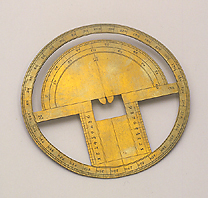 It was used as an accessory for plotting routes and indicating bearings on nautical maps. It is of English manufacture and belonged to the bequest made by Sir Robert Dudley to the Grand Duke of Tuscany (1649).